Cut the cord! Plug in the receiver and experience the WaveBird - with the same control features of the regular controller, but with wireless game play up to 20 feet. 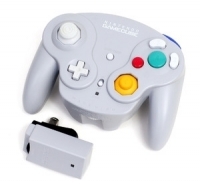 Any combination of up to four WaveBird Wireless Controllers or regular controllers can be connected to the Nintendo GameCube. 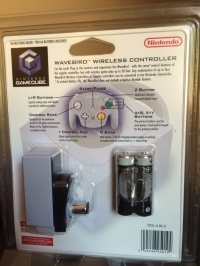 09-03-2016 aliensstudios Box Text WAVEBIRD WIRELESS CONTROLLER Cut the cord! Plug in the receiver and experience the WaveBird - with the same control features of the regular controller, but with wireless game play up to 20 feet. 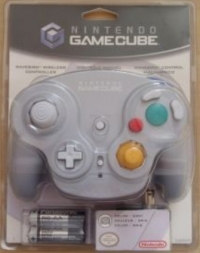 Any combination of up to four WaveBird Wireless Controllers or regular controllers can be connected to the Nintendo GameCube. This is a list of VGCollect users who have Nintendo WaveBird Wireless Controller (Gray) [NA] in their Collection. This is a list of VGCollect users who have Nintendo WaveBird Wireless Controller (Gray) [NA] in their Sell List. This is a list of VGCollect users who have Nintendo WaveBird Wireless Controller (Gray) [NA] in their Wish List.